The North of the Patagonia has almost unexplored, almost virgin regions. In a geisers mark, waters thermal and immense valleys and gulches rises the point but high of The Patagonia. This is an impressive trip for sharp throats, drawers and summits of mountains, with extraordinary views. 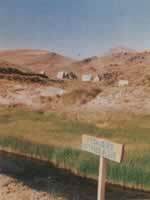 In the base of the Domuyo, of 4.709 meters of altitude, it will be surprised with streams of waters hot and only geysers of the country. The traveler will have the experience here of being in the roof of the world, surrounded of streams of hot waters, with algae that resist high temperatures, geysers (intermittent spouts of vapor of water of high temperature) and the imposing presence of the polícromo volcano Domuyo, turned off in the last glaciation. 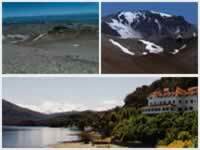 The natives knew these places and Chilean visitors converged to their thermal waters. The Colonel Olascoaga traveled and it published news of this system for the first time in 1901. These waters are alkaline, very mineralized, still more than in Copahue, with a pH of 6,9. The thermal denominated algae, they can live in waters with temperatures of between 70°C and 87°C , they are of color green-blued by the presence of a blue pigment associated to the chlorophyll. Botanically knows them to him as Rivulania haemabites, of importance for the treatment of affections of the skin. The first day we leave very early from Chos Malal in a van 4x4, we go to the base of the volcano Domuyo. 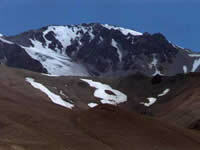 Once there we begin with the walk until making a camp it bases to 2300 meters where we will spend the night. The second day we begin the walk in the 2300 meters and after a slow ascent we make a stop to the 2900 meters , in this place we carry out a new camp. The third day we leave of the camp of 2900 meters and we arrive an afternoon to about 3700 meters where we carry out a new camp. To this height the climate is quite cold with that which is necessary the use of coats of high mountain. In the fourth day "we attack the summit", we pass penitents of almost 2 meters , narrow passes, transporting and finally the Summit of the Domuyo, the point but high of The Patagonia. After admiring a spectacular landscape we go down to the camp of 3700 meters , we dismantle the carps and we lower until the camp of 2900 meters . The fifth day we descend until the base, transfer to Aguas Calientes where waits for us a repairman thermal bathroom and a good roasted Creole. Night in Chos Malal.